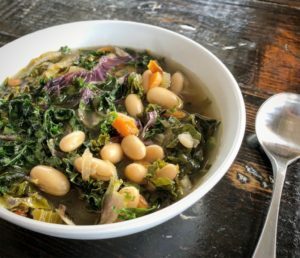 White Beans, Fresh Kale, Chopped Celery, Shredded Carrots, Fresh Garlic, Chopped Red Onion, Rosemary, Thyme, Oregano, Garlic Oil, Veggie Base and Crushed Red Pepper. Housemade & Famous! This Soup is Full of White Beans, Fresh Kale, Chopped Celery, Shredded Carrots, Fresh Garlic, Chopped Red Onion, Rosemary, Thyme, Oregano, Garlic Oil, Veggie Base and Crushed Red Pepper.